Comments: A beautiful woman is on the run and her life being in danger is clear. She is an intense character. 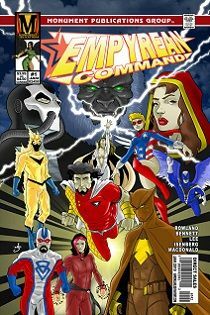 The Empyrean Command look impressive with a powerful group and a variety of super-heroes. Dark Siren, Quadricep and Baron Samedi are lead by Midnight Owl against Professor Mortis and his undead army. This comic jumps around to much rather than focusing on one or two parts to the story. You barely start to get into a scene before it changes. Vadoma she is using a weapon of power and raises undead threats. Bluejaye, Lightbringer, Geo-Ace and X-Factor face off against her. The characters here are not overly original. A creature bursts free from a meteorite and a team of heroes rushes to meet it. Victory, Valiant, Captain Unity, Thunder Woman and Steel Wolf make up the team. The creature of evil is Ahriman. There are to many characters in this issue. There is not enough time to let you get to know any of them so you care about them and what happens to them. The story needs more to it to hold the readers interest. It needs to be more than just heroes and villains fighting. The backup story "Empyrean Command" starts out with a blast. Lots of super-heroes and a villain with robots. There is a lot more going on to which is not explained. The bodies in a few panels are not draw proportionally right; short arms in one and a scrunched up neck in another. At the back we do get a history of the Empyrean Command. This group is large and full of so many different characters. You will get your fill of super-heroes here and than some.